We cover all problems involving your locks and keys. For more information, see the list of FAQs below. Get answers to your own questions! Find out what's the best way to deal with issues related with keys and locks. How long will it take for locksmith to fix or repair my broken lock? Duration of locksmith services may vary with the type of jobs. For example, a mortice lock change would take the locksmith an average of 40 to 50 minutes to complete. While simpler locks such as Yale locks are commonly completed by locksmiths for less than hour. 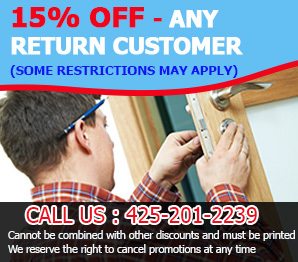 “Locksmith Kirkland” are skilled in repair and maintenance for your lock and key concerns. They are trained in handling varieties of locksmith issues. I own a key that has a mark on it that reads “Do Not Duplicate.” Can I have a copy of it anyway? Keys which are marked with “Do Not Duplicate,” “Unlawful to Copy,” or “Do Not Copy,” can be copied only if a letter of authorization from the owner is provided. This will act as the request for duplication. The person picking up a copy of the key will be required to sign on the “Request for Restricted Keys” form. How is a deadbolt lock installed? Our experts recommend at least one each of throw space on the strike side. You also need a security plate which must be screwed at least three inches right into the wooden frame of the door. A thumb-turn lock is no good near openings. It has the same design as traditional strike plates, with additional features which are designed to make that and the entire lockset more resistant to opening attempts. One of the features is a special reinforcing plate made of heavy-duty metal. Additionally, the security strike plate is attached to the door with 3-inch screws rather than the traditional 1-inch screws.